A bit of a lack of posts over the past couple of days! Apologies about that, but I've been having a really pleasant break from life. I literally have no commitments at the moment (except finding a job I guess)! It's a strange yet relaxing(ish) feeling. Anyway, the one thing on my mind, which is fast approaching, is my holiday, which is in early June. 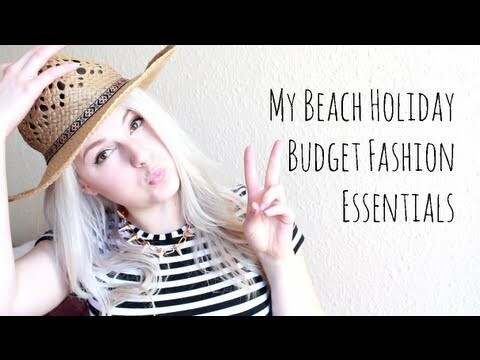 This one was a bit of a spur of the moment video, I thought it might be handy to show my budget holiday essentials (fashion-wise)! Although, I'll warn you, I am definitely not the most stylish creature on holiday! Enjoy another bank holiday weekend (seriously, I never realised there were two so close together?!?!). I'll be posting about my Company Style Blog Awards bargain outfit soon (I've planned it all out finally, whoopie!). Excited to share it with you all :)! Your sunset bikini looks cuuute, it reminds me of We Are Handsome! Really like your oversized bag too and I'm also a Kaftan/Kimono lover. P.S Can't wait to see you tomorrow! The sunset bikini is really cute. It's so nice to see budget videos/posts, being a student I can't always afford more expensive things!